Slauson Middle School librarian Laurel Maguire recently asked students to do something that horrified them. She challenged them to give up their mobile devices for a day. About six middle schoolers agreed to go a day without using a cellphone, iPad, computer, TV, videogram, or social media of any kind. She said the six participants—all of whom will receive a gift card to a local bookstore—reported that the digital fast gave them back more time in their day. Other studies show the drawbacks of too much screen time. Librarian Laurel Maguire takes a photo of Lana Altawil, who likes to unplug and read a good book. 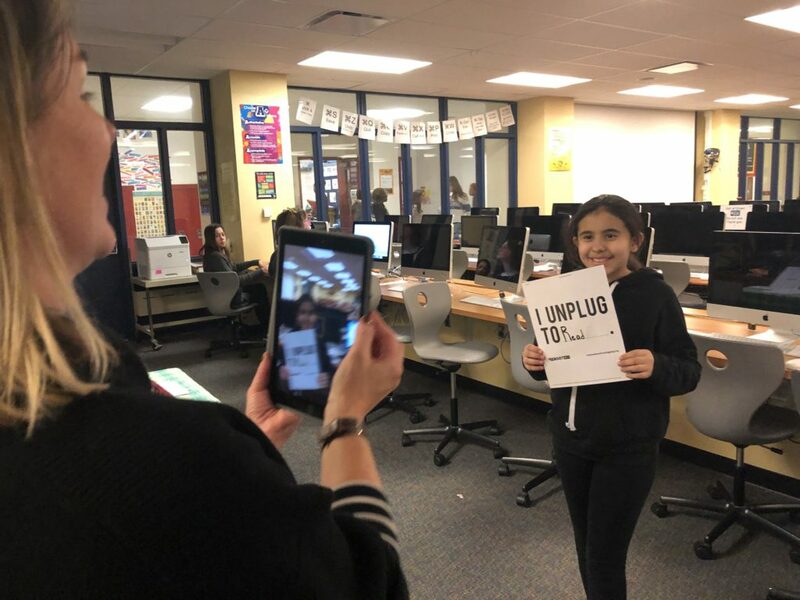 Even if they didn’t sign up to be device-free for a day, many kids during Slauson’s Digital Citizenship Week were willing to share what activities they like to do when they are “unplugged,” she said. “My goal was to bring up issues of media use in a non-judgmental way to encourage kids to reflect on the social and emotional impact of our media use,” she said. As is the case at other AAPS middle schools, Slauson students are allowed to bring cell phones to school – and the overwhelming majority do, says Maguire. However, students must keep them in their lockers unless they’re in a classroom where the teacher allows cell phones to be used for a specific purpose. Lana Altawil, a Slauson seventh grader who has owned an iPhone since fifth grade, said she thinks it’s a good idea to take a tech break because too many people pick up their cell phone when they’re bored. She said she uses her phone for videos, Instagram and Snapchat, but realizes it sometimes makes her want to be somewhere else. “I’ll see pictures of people going rollerblading or to cool restaurants in downtown Ann Arbor,” she said, agreeing that sometimes it makes her feel she’s missing out. 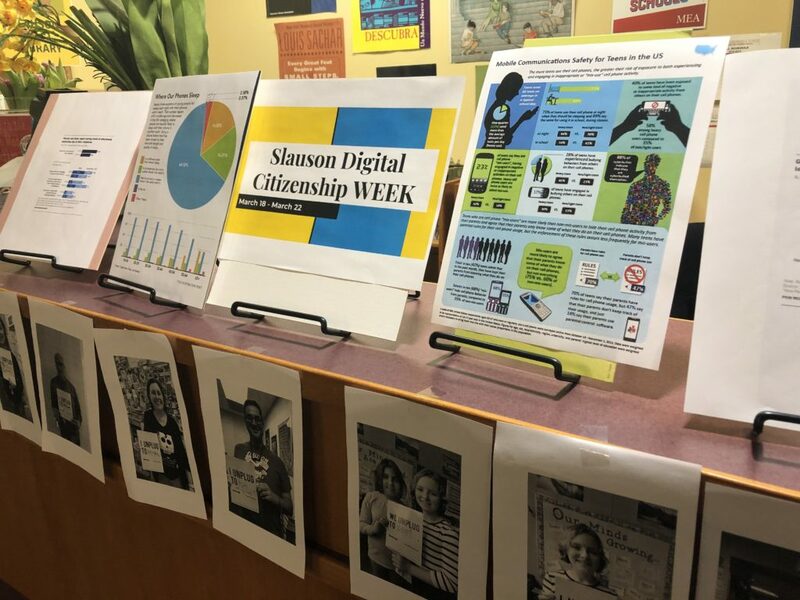 The other AAPS middle schools held Digital Citizenship Week—an annual event— in the fall. Clague Middle School’s digital citizenship curriculum is delivered to students with instruction and interactive lessons designed to empower students to behave responsibly and think critically in the digital world through the school’s annual Common Sense Media Digital Citizenship Certification renewal. Scarlett Middle School’s Language & Literature students work with University of Michigan students on digital citizenship units in the fall. Click here to learn more about their work.